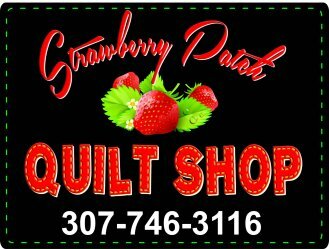 Strawberry Patch Quilt Shop is a friendly new gathering place for sewing enthusiasts in the Newcastle, WY area to enjoy leisurely shopping and a relaxing atmosphere where they can learn, mingle and share ideas and creative interests over a warm cup of coffee. While owner, Bev Lliteras, had always dreamed of opening a quilt shop, she was busy teaching school and helping her husband fulfill his own dream of starting a construction business. After he passed away in 2012, Bev retired from teaching and sold the construction business. When she and her daughter, Robbie, were presented with the opportunity to buy a quilt shop, Bev started a new chapter in life...owning and operating her dream business! Bev has been quilting for 15 years and Robbie started quilting five years ago (her mom bribed her to attend quilting retreats, with the promise of some outdoor activity). Bev enjoys a wide variety of crafting mediums, including tole painting, sewing wool projects, scrapbooking and creating leather crafts. She's thrilled to have the opportunity, through Strawberry Patch Quilt Shop, to provide a welcoming environment that encourages learning and inspires creativity, while allowing her to indulge her own creative passions and share her skills and talents with others.